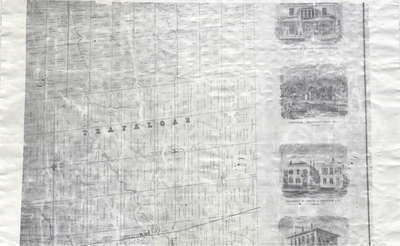 This map lays out the land division and ownership of the Trafalgar township region as of 1858. It is one of eight maps of the Halton townships. It also includes depictions of important local buildings including the residence of George K. Chisholm Esq., Chisholm Brothers’ Grist Mill, and the residence of Robert K. Chisholm Esq. Section 6 of 8.